Your website is the single greatest tool your business has in its marketing arsenal, so it must be brand consistent, device responsive, easy to use and understand, and provide a striking, memorable experience for visitors. According to HubSpot, one-third of all new websites fail. Doing it right the first time is more cost-efficient than making big corrections down the road. So, should you go with a freelancer or full-service agency? Copywriters who design customer-centric messaging based on conducted research. A web accessibility expert. It is estimated that around 15% of the world’s population have a disability. Accessibility is about making your website universal so as many people as possible can use it comfortably, particularly those with disabilities and older people with changing abilities due to aging. See our blog post here on the importance of designing a website with accessibility in mind, and an easy way to check your website for one of the biggest barriers people with disabilities face on the web – keyboard accessibility. A usability expert who creates user-centric experiences based on years of research and best practices. 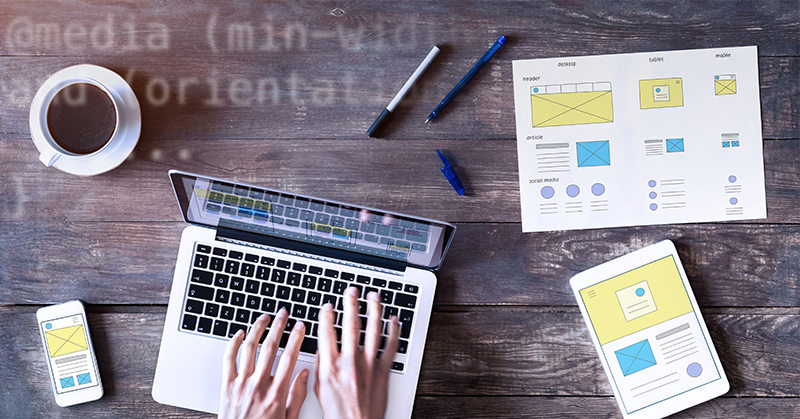 A User Experience (UX) designer addresses the needs of both your customers and your business by working with you to develop a content strategy and information architecture for your website. In the end, you’ll have a turnkey, search-friendly, responsive website…which means better user engagement, easier and quicker information finding, quicker task completion, more happy customers, and a better perception of your company. Our UX designer gives her take on the importance of good user experience here. Graphic designers who transform these plans into effective designs. Coders and programmers who convert the designs into a functional website, which is tested by a quality assurance expert. Which tool should they use to build your website? There are many options. We like WordPress because it’s probably the easiest and most powerful blogging and website content management system (or CMS) in existence today. It’s an open source software which means you won’t have to pay the high monthly fee of using a proprietary CMS, and a large community of programmers contribute to building new plugins so it is very easy to add features and functionality down the road. Many years ago, WordPress was mostly used to create blogs instead of websites. That hasn’t been true for a long time, though. Today, thanks to changes to the code as well as WordPress’ huge ecosystem of plugins and themes, you can create any type of website with it. One of the common misconceptions about WordPress is that since it is open source, it may not be good enough for big brands. To disprove this myth, consider some of the most notable big name brands which use WordPress today: The Rolling Stones, Mercedes-Benz, BBC America, Microsoft News Center, Facebook News Room, The Walt Disney Company, CBS New York, SONY Music, New York Times, Dole, Glad, The New Yorker, Mercedes-Benz, the official Star Wars blog, MTV News, Vogue, and even The Whitehouse. In fact, 80% of websites that have a CMS use WordPress. In summary, I believe it pays to work with a full-service agency over a freelancer for your website build. It usually comes with a higher price tag, but with that comes experience, efficiency, and a team behind you. The things you need to get it done right the first time.